Wow, 3 generations of the Sungue Pride seen together this week! 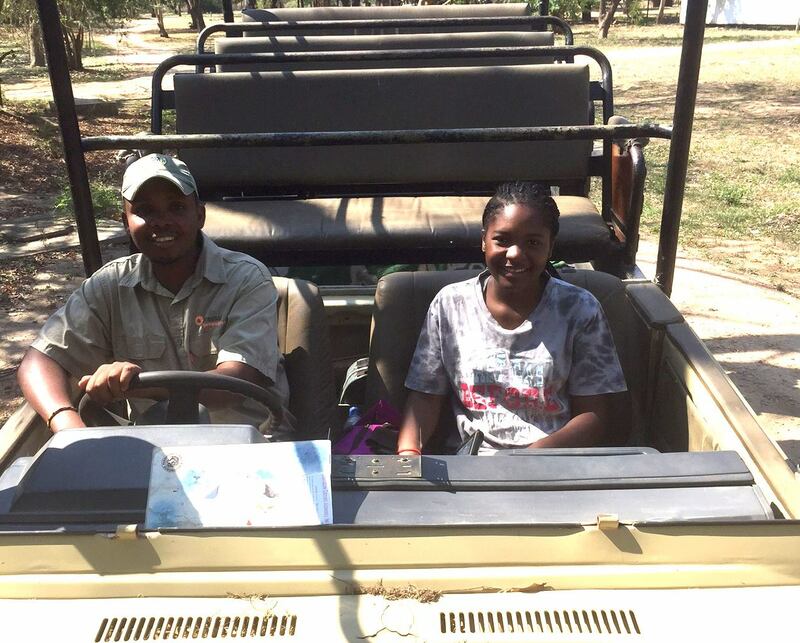 Cleopatra with 4 of the 2014 cubs and… guest of honor Mozambique (the older male here and a Sungue cub of 2013.) Cleopatra is Mozambique’s grandmother and mother and aunt to the cubs seen in the background. The cubs were curious and wanted to socialize with Mozambique but that resulted in him being walloped each time by the fiercely protective Cleopatra. An intriguing interaction! Flavia has split from the pride (and her 14 month old cubs) and begun mating with the newly arrived Xivulo Coalition. 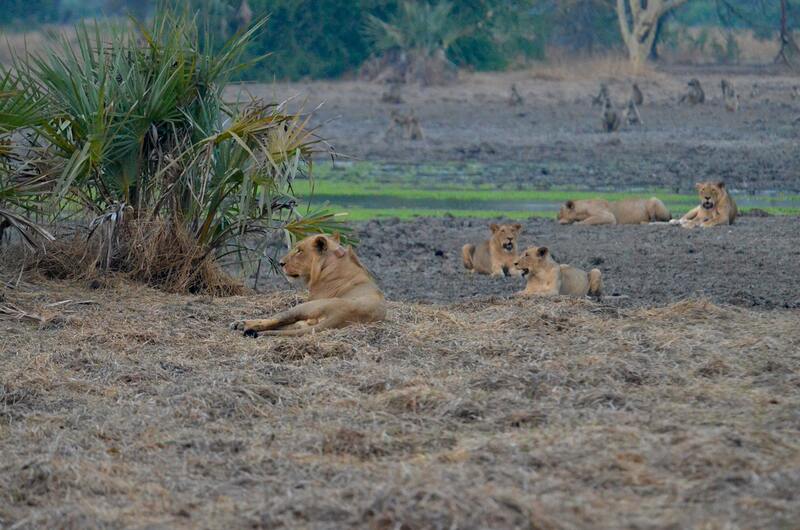 Some of Gorongosa’s safari guides captured this fierce moment ! This male (we are calling Xivulo M2) showed up out of the blue with one of the Park’s oldest males a few months ago. They have seized the core area of the Sungue range and have been mating with two of Nginga’s recently claimed courts – Flavia and Pandora. New cubs are likely on the horizon this year or early next year – stay tuned! 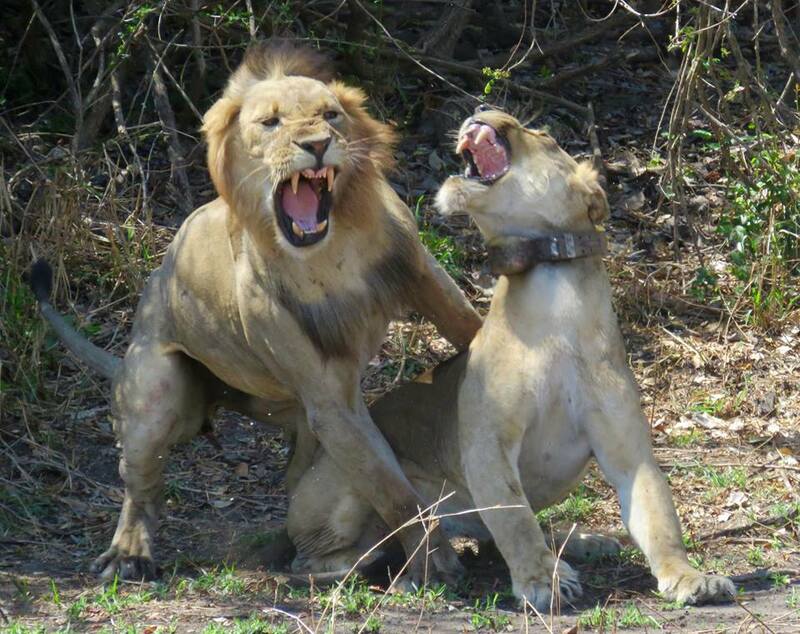 Xivulo M2 (male) and Flavia (collared female) mate after Flavia splits from her pride. We just got back to camp after some intense field work to find that the WildCam images are 28% complete! That makes us so happy to have an extended team around the world working with us. We will be posting nuggets from our field diaries over the next few weeks, so stay tuned. We were setting up trail cameras along the Urema river today, deep in a remote part of the park when we noticed that we had some curious onlookers. This herd of buffalo seemed to wonder what we were doing with these funny looking cameras on their trees. These buffalo may be from one of the groups that were relocated to Gorongosa to help boost the buffalo population that was almost wiped out during the war. 85 buffalo were relocated from other parks between 2006 and 2009 and their population is on the rise. We hope you find some of these beautiful creatures in the WildCam photos! A herd of buffalo look on as we set up these funny looking cameras.